Lori's Horse Portraits Blog: Lori's Horse Portraits Up and Running! 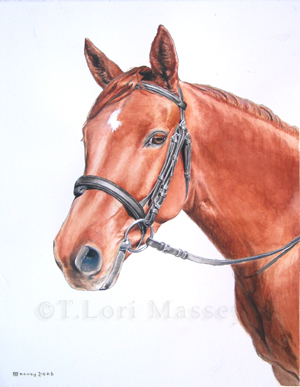 Lori's Horse Portraits Up and Running! October 28, 2008 -- After spending many years painting in various themes: landscapes, wildlife, flowers, modern, surreal, and boats (you can't live in Southeast Alaska and not paint boats...or fish, for that matter) I've finally put my passion for horses together with my love of painting. 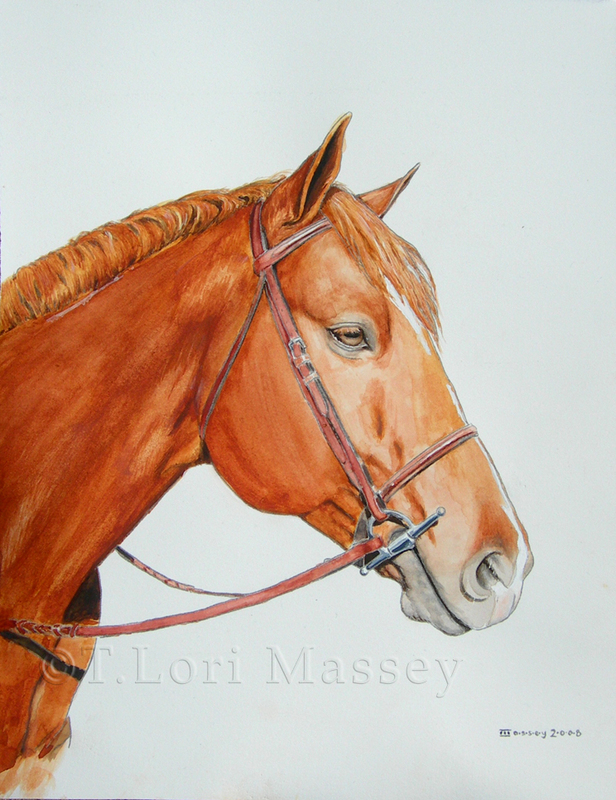 I was so inspired after taking a photo of Oliver, a large sorrel quarterhorse, that I had to paint him. He's so calm and nice, a happy, honest horse who'll try his heart out for you. When I was finished with the painting, all these qualities were evident in his face. You can see his soft eye, his relaxed but interested ears, his almost smug mouth. He knows he's doing well and he's well loved. He likes to work, and protests when its time for his rider to go. What a horse! Oliver is owned by a lady who does love both her chestnut quarterhorses. She's out of town right now, but I can hardly wait until she sees this portrait. My next painting was of Rose, our newest horse. She is a three year old Hanoverian filly out of Marefield Meadows, and she's lovely. She's young and curious, as well as intelligent and focused. You can see her fine mind in her direct gaze and alert ears. Even for her youth, she has a regal bearing, and this self assuredeness was very fun to paint. Her velvety coat is getting longer because the weather has turned cold, and her ears are fuzzy because she's still a baby, and they've never been clipped. She's very sociable and isn't sure about apples yet. Her favorite treats are peppermints. I was going to keep this painting, but her trainer (who first broke her to saddle) bought this portrait when she saw it. I don't mind at all, I'm going to paint Rose again, probably several times because she 's so expressive. What a wonderful feeling to have connected with these two horses on such an profound level. Creating replicas of them that show not only their outsides, but having their spirits somehow shine through was wonderful. I already have my next two paintings lined up!